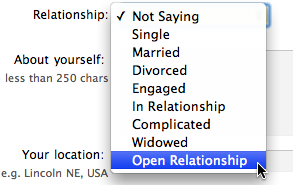 OpenSocial has a "relationship-status" field, plain text. XFN was not directly intended as a relationship status format, however, it's use can imply some relationship. 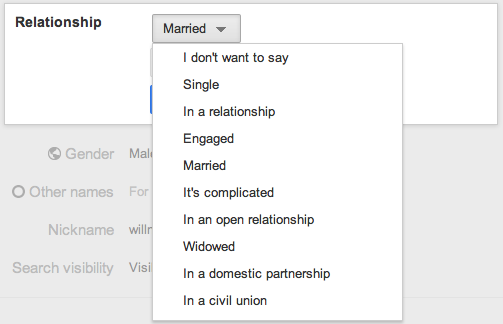 Here is a unified enumerated list of all the above relationship statuses (parenthetical text provided for turning the statuses into sentences and optional person parameter where it might apply, note that not all instances of optional with person parameter have been found in the wild, but they may be possible in UIs - indicated as "possible optional"). While this might be a good start for a set of enumerated values, we lack sufficient data to be confident in such a set. If we had perhaps half dozen or so examples total which showed a clear set of common values, then we could be more confident defining an enum. Until then, it may make the most sense to simply use a text string value. 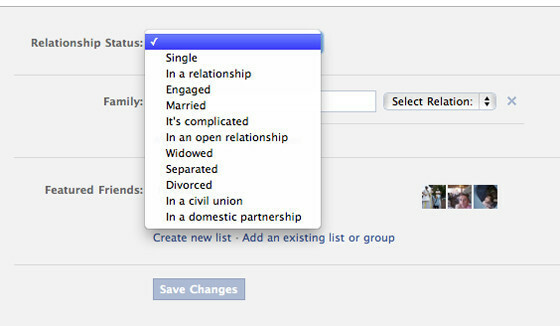 In addition to the description of the relationship-status, as noted, some number of values take a "with" parameter referring to a person. "fiancee/fiance" - used on a link to someone who is the person is engaged to. both spellings accepted, neither implies the gender of either person. "open-sweetheart" (other suggestions encouraged) - Someone with whom you are intimate and at least somewhat committed, but open to other romantic relationships. Symmetric. Not transitive. Essentially like "sweetheart" but without implication of exclusivity. The other relationship values that involve another person (divorced, separated, widowed) so far have no documented examples in the wild which refer to another person, thus it is premature to brainstorm possible XFN values for them. Simple brainstorm proposal: use the property name relationship-status as a class name on an element marking up a textual value / description of the person's relationship status.